What an interesting, surprisingly delicious bowl of soup! Surprising because I think, no I'm certain, I don't like kimchi. It is the smell that puts me off, that pungent, lingering odor of fermented, near-rotten something that permeates the atmosphere. Ugh. The taste of kimchi is a different thing entirely, a complex blend of sour, sweet, spicy, salty and some other indescribable flavor note. Tame the smell and I'll enjoy it, maybe even love it. Earlier this month I went bonkers over Marination Ma Kai's fish tacos with kimchi-flavored crema. Bonkers enough to ask for their crema recipe, then rush to the grocery to buy a jar of kimchi base. Surprise! my local Safeway stocked a Japanese product designed to provide this unique Korean flavor. That jar remained sealed for days while I fretted over the potential smell. Finally I opened it to use in this stew-like soup. No problem, there was no noxious odor. Korean food packs a hefty flavor punch so I attacked that issue first. Building a tasty broth was all-important, but it should not kill any taste buds with over-spiced heat. Okay, forget the red pepper flakes, use a small amount of RL's favorite kimchi-in-a-jar, and hold back on the kimchi base. 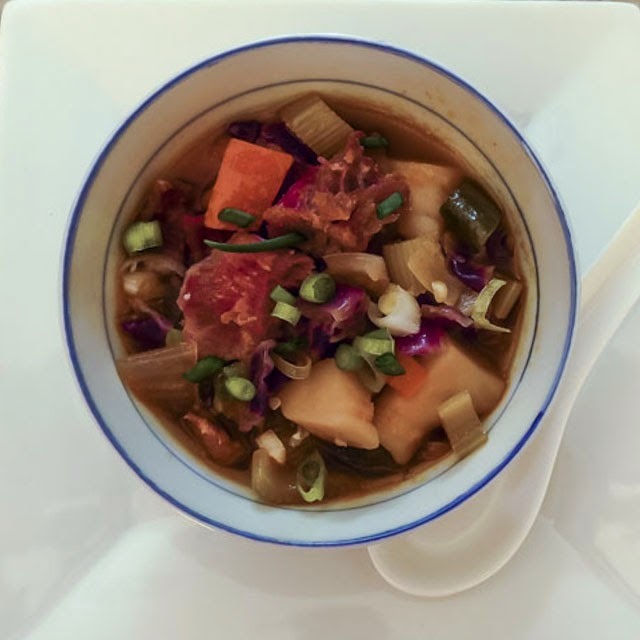 Smoked pork neck bones, pre-boiled to diminish their saltiness, plus a mix of beef broth and chicken broth combined with the vegetables and aromatics to build layers of flavor in the broth. This took several hours but the soup was off to a good start. Finally, after a quick finish to cook newly-added fresh vegetables in the strained broth, we were ready to eat. The soup was delicious on day one, but doubled in flavor by day two. It went from a perfectly fine, sort-of Korean style bowl of soup to a "what did you do to this to make it so awesome?" bowl. Well, it must have been the kimchi. For the next batch I'll bravely add more prepared kimchi vegetables and juice plus an extra tablespoon or two of the kimchi base. Yes, I will make this soup again, though I may never learn to love the smell of kimchi fresh from a jar. Place the neck bones in a large kettle, cover with water and bring to a boil. Cover and cook at a low simmer until the meat is tender enough to pull from the bones, roughly 1 to 2 hours. Remove the meaty bones from the pot, rinse and set aside to cool. Discard the cooking water. Separate the meat from the bones and cut or fork apart into bite-size pieces. 5 neck bones yielded 2 cups of meat chunks. Retain the fat and the bones to use in the broth. Add a thin coat of oil to a large skillet and heat over medium-high heat. Add the chunks of fat pulled from the pork bones and cook until crisp to render out any remaining fat and flavor. Discard the crispy bits (and try to resist the temptation to nibble on them for snacks). Add onions, carrots and celery to the pork-flavored oil; sauté 2-3 minutes; cover and sweat the vegetable for 3-5 minutes. Uncover and add garlic and ginger; cook another minute or two until fragrant. Add cabbage, kimchi vegetables and juice, pork bones, broths and enough water to cover the bones. Bring to a boil, skim foam as necessary, then simmer uncovered for 1 hour. Strain the broth and discard all solids. Return the broth to the large kettle and return to a low boil. Add the chopped vegetables and simmer until the potatoes are tender. Sample the broth; stir in kimchi base and adjust flavoring until it suits your taste. Serve with Sriracha or Chili-flavored sesame oil for individual flavor adjustment.